NEW YORK, NY-Manhattan clubbing is a little more upscale at The Manor, where the approach to nightlife is truly luxurious. Those who are lucky enough to make it inside experience an exclusive environment where proscenium arches, dioramas, and dark leather set the scene, and the clean power of a complete Danley Sound Labs loudspeaker system sets the pace. 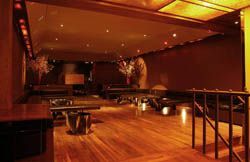 The Manor in New York City cleverly hid six Danley SH-50s, six Danley SH-112 subwoofers, and eight Danley SH-100s throughout the club. The subs are buried in the floor under the banquettes, The SH-50s are the soffits above the dance floor, and SH-100s are carefully hidden in the corners. According to Steve Petrik, systems designer of D&A, his decision to design the sound system around eight Danley Sound Labs SH-100 full-range loudspeakers, six SH-50 three-way loudspeakers, and six TH-112 subwoofers, has enabled the 5,000-square-foot, bi-level Manor to deliver a premium sonic experience to its selective patrons. "This is one of the best-sounding systems that I've heard in New York City in several years," Petrik stated. "It has to be able to handle almost every genre of music, including hip-hop, rock, dance, and even jazzier styles. When people come in here for the first time, they're surprised to hear a New York City club system that sounds so clean and powerful, without distortion. "An experienced AV integrator and designer, Petrik was presented with one of his most challenging objectives in The Manor. Working closely with architect Mark Dizon of D&A, Petrik was asked to bring an elegantly uncluttered look to the club. "They wanted to conceal everything-the speakers, lights, projectors-in the architectural features of the space," he said. "Along with that, they wanted a complete audio and visual system that would be highly configurable, in an environment that was sonically transparent. I knew that by using Danley Sound Systems loudspeakers, we'd get a cleaner sound and power than with virtually any other loudspeaker manufacturer at that price point." At The Manor, an upscale Manhattan club, the 60-inch flat plasma screen is concealed behind a one-way mirror. In the main upstairs room, the six Danley Sound Labs SH-50s angle down invisibly from within the ceiling soffits, providing substantial directivity fulfilling Petrik's creativity. "I designed the system so there's a considerable drop-off in volume-four or five dB-from when you're standing and dancing in the middle of the room to when you're seated on the edge," explained Petrik. "Because of the tight pattern control of the speaker-truly 50 x 50 almost down to 250Hz-it allows you to aim the speakers on the dance floor and focus the energy there, not on the people sitting on the sidelines. "The SH-50s have a very wide range, but they sound very clean throughout. They just won't distort, even if you keep pushing power into them. The DJs at The Manor tell me that they hear things in the music at this club that they've never heard before. And because the SH-50s are passive with a very good crossover design, you eliminate the need to bi-amp them. For this particular installation that eliminated six amplifiers, which translates to a very large cost savings to the client." The Manor may be a high-end hangout, but its patrons will be treated to plenty of strong low-end via the six TH-112 subwoofers, which are built deep into the floor with their horn mounts inverted, resulting in maximum performance and space efficiency. "We only have six inches of speaker exposed to the floor, and the rest is sunken into the basement," Petrik said. "It sounds incredible. These subs are particularly well-suited to dance music. The Danley Sound Labs TH-112s have substantial power all the way down to 28Hz. You just don't need a lot of amplifier power to get high-SPL of low-end program material in this space." With the Danley Sound Labs speakers so integral to the building's design, Petrik was counting on their solid build and the company's strong support to make sure the critically important initial construction stages went smoothly. "Since the speakers are basically part of the building, they had to be installed at the very beginning of construction," he said. "All of the cabinets have standard rigging points, which made installing them in the space very easy. Their build quality is as solid as any other speaker I've ever used. Danley Sound Labs knew we had to get these speakers early, during the construction process. And they made sure everything was on time and performed without any problems." While a pristine-sounding audio setup may seem to be simply a luxury within a crowded nightclub environment, smart club owners realize that it's actually a business necessity. "Providing a sound system that isn't taxing on the patrons of the venue allows the venue to make more money. Clubgoers stay longer when the sound works whether they're talking or dancing," Steve Petrik said. "The fact that The Manor has the clean, amazing sound that the Danley Sound Labs system provides is a great marketing tool for this club. It makes for a more enjoyable environment."